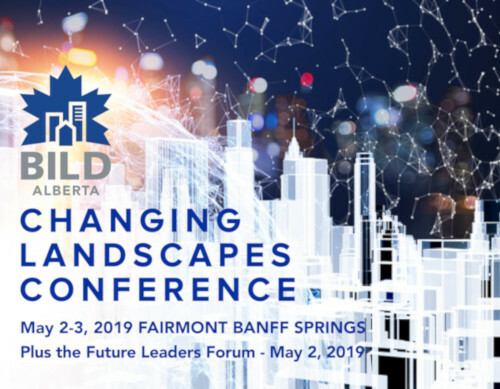 The 2019 Changing Landscapes Conference is hosted by BILD Alberta. If you have any trouble with this form or have any questions about registering for this event, please contact [email protected]. Our regular business hours are 8:30 am to 5:00 pm (MT) - Monday to Friday. Future Leaders Forum is SOLD OUT. Please contact [email protected] to be put on the waitlist. Future Leaders Forum is SOLD OUT. Please contact Cynthia Osepchuk at (780) 436-0983 ext. 235 to be put on the waitlist. Would you like to add on a ticket to the Opening Reception? What line of business do you represent? *Do you consent to receive email updates about the BILD Alberta Spring Conference and future conferences organized by BILD Alberta? *A list of delegates to the conference will be made available to all registrants. This list will include name, job title, organization and city. This section will only populate for 'speaker' registrations. *Do you consent to having your presentation and notes be posted online in PDF format? *Do you consent to having your session recorded? Yes No, I do not use a Mac. The biography will be included in the program, on the website, on the conference app, and will be used for introductory purposes. The photo will be included on the conference website and conference app. Acceptable formats include .jpeg, .jpg, .gif, .png. Additionally, please upload a copy of your PowerPoint presentation. Accommodations are not included in the registration fee and are the responsibility of the attendee to book. You will receive information on how to book your hotel room in your confirmation email upon completing your registration. Limited space is available. Speaker accommodations are managed by the Conference Coordinator. Additional information / requirements for your accommodations or additional rooms to be booked. Please select your preferred session for each of the below breakout sessions. Due to room size, there is limited space available and changes may not be able to be accommodated. To view the full program and program descriptions, please click HERE. If there is nothing in this session to select and you want to attend a breakout session, please scroll back to the top to choose a different registration type. Please let us know your attendance for the following special events. If there are no choices in this section it means your registration type is not eligible to attend the special events. If you wish to attend any of the special events please scroll back to the top and choose a different registration type. *Will you be attending the Opening Reception? *Will you be attending the Closing Reception? *Would you like to bring a guest to the Opening Reception? Notice of cancellation must be made in writing to the Conference Secretariat at [email protected]. A $63.00 cancellation fee (incl. 5% GST) will apply for all registrations cancelled before April 29, 2019. No refunds will be made after this date. 1. All registration fees are subject to 5% GST and must be paid in Canadian Dollars (CAD). 2. Advance registrations will be accepted until 11:59 pm MST on April 26, 2019, after which registrations will only be accepted on-site. 3. Substitutions may be made until 11:59 pm MST on April 26, 2019 by writing to [email protected]. 4. Credit card payments must be made by VISA or MasterCard. Your statement will read "BUKSA Assoc. (780) 436-0983 Edm". 5. A confirmation notice detailing your registration will be sent to you immediately upon completion of this registration form. If you do not receive this confirmation within 24 hours please contact us at [email protected]. 6. Recording may occur throughout the conference; by agreeing, conference attendees consent to filming, photography and sound recording as delegates, speakers or exhibitors at the conference. 7. By agreeing to these policies you consent to receive updates about the BILD Alberta Spring Conference and future conferences organized by BILD Alberta. 8. All registration rates are subject to availability. You will be prompted to enter card details after submitting this registration. Please click submit to proceed. If you have any questions, please contact the Conference Secretariat at 780-436-0983 x 233 or [email protected].